Pressure-controlled ventilation is a pressure-preset time-cycled ventilatory mode in which a set pressure is delivered by the ventilator. This contrasts with the preset tidal volume of volume-controlled ventilation. Pressure-controlled ventilation is one of a group of pressure-preset modes which includes pressure support ventilation and airway pressure release ventilation. The pressure responsible for delivery of the tidal volume is the gradient between peak alveolar pressure (determined by the preset ventilator pressure) and end-expiratory alveolar pressure (total positive end-expiratory pressure (PEEP)). The tidal volume delivered is influenced by the length of time that this pressure is applied which, in turn, is determined by ventilatory rate and the inspiratory-to-expiratory (I:E) ratio. The tidal volume also varies according to a number of patient factors, including total respiratory system compliance, airways resistance, and intrinsic PEEP ( Blanch.etal 199.3a. ), which interact in a complex way. The dynamics of pressure-controlled ventilation have been determined by mathematical modeling and validated experimentally ( BMrkeeLal 1993). 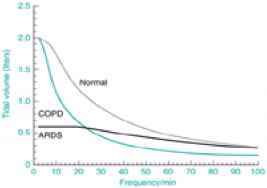 For a given preset pressure and I:E ratio, the tidal volume falls as the ventilatory rate increases ( Fig 1). In the normal lung, increasing ventilatory rate results in a decreased tidal volume. Changes in compliance affect tidal volume, with a decrease in thoracic compliance resulting in a proportional decrease in tidal volume. The tidal volume achieved with non-compliant lungs (e.g. in acute respiratory distress syndrome) is small, with little change as ventilatory rate increases. Tidal volume decreases markedly at higher ventilatory rates in patients with increased airways resistance (e.g. chronic obstructive lung disease). Increased expiratory resistance may produce intrinsic PEEP, reducing the tidal ventilatory pressure and therefore the tidal volume. The decrease in the delivered tidal volume may be overcome by increasing the inspiratory time fraction to allow for pressure equilibration. As a result of the limitations in tidal volume delivery with increasing respiratory rates, minute ventilation increases to an upper limit determined by lung mechanics (Fig 2). An optimum value for alveolar ventilation occurs at some level of ventilatory rate owing to the relative increase in dead-space fraction as tidal volume decreases.